Storage for phones, tablets cameras or any other device often is measured in capacity. As the demands for more and more storage increase, the need for faster storage also increases. A phone or camera that can record videos at 120 frames per second will not only need greater storage to record the videos to, it will demand a faster write speed of that storage. As you shop this holiday season looking for the perfect gifts, we're sure there will be some shiny new toys in there that will fall into the category we've described. Did you just purchase a shiny new Galaxy Note 4? Do you have a new GoPro 4? To get the best performance out of your new toys, the quality of your storage will be important and not all micro sd cards are created equal. The card comes in sizes with current market prices ranging from $10.99 up to $52.90 on Amazon. 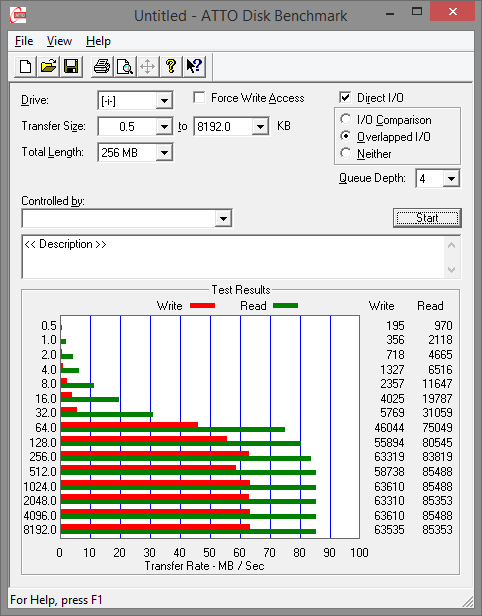 If you are unfamiliar with UHS Speed class, it was introduced with SDHC and SDXC. It's another class that identifies the minimum performance of the card. If you take a look at the chart on wikipedia you can see that it has the same minimum speed as a Class 10 drive would have. If 10 MB/s is the minimum performance of a Class 10 and UHS Speed Class 1 (U1), then how does the SDCA 10 stack up in real world performance? For our tests, we used a USB 3.0 card reader to put the card through the ropes. After that we used the card in a Note 3 plugged in to a USB 3.0 port on our computer to test transfer speeds between computer and phone (more on that later). From our first test with ATTO we can see right away a couple of interesting things. First off, the jump from the 32 KB speed test up to the 64 KB speed test is extreme to say the least. I was expecting a slightly more gradual increase in speed but that massive jump is nice to see. 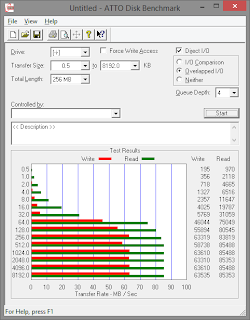 Another point of interest is that once we get to 256 KB sizes the card levels out in performance with write speeds reaching up around 62 MB/s and read speeds hitting a solid 83 MB/s (Each MB being 1024 KB). Our real world testing showed signs of write speeds around 70 MB/s and read speeds of 85 MB/s. These numbers were pleasantly on par with the ATTO benchmark in every way. After using such a fast drive in my smart devices and seeing real world performance gains I don't think I could ever go back to a cheap SD card with slower speeds. There are devices on the market now that demand more from our SD cards. If you're an owner of a new GoPro Hero 4 or a phone/camera that shoots 120 frames a second of video then you will need an SD card that can deliver the speeds required for that much data. We recommend the Kingston SDCA 10 for the job. Of course if you're shooting raw HD videos you will need something capable of writing closer to 100 MB/s; however, most consumer products will be shooting compressed HD video and th Kingston SDCA will be more than capable for the job.